Online Registration is active now until June 1st, 2019. Join us for Canada’s “2019 Two Row on the Grand” and Paddle Down the Grand River with Haudenosaunee Nations! We’re following up the successful 2013 Two Row Wampum Renewal Campaign on the Hudson River, the 2016 and the 2017 Two Row On The Grand. 2018 saw another great experience of paddling, sharing meals, campgrounds and teachings. This coming summer’s event will be another symbolic enactment of our original Two Row treaty – put in place over 400 years ago. Help us bring the treaty to life paddling down the Grand River from Cambridge to Port Maitland. We will paddle in “Two Rows” – one Indigenous row, and one settler/immigrant row – to demonstrate the simple concept of the Two Row Wampum Treaty. Our teachings say to paddle down the “river” of life on parallel paths, as friends close enough to help each other, but not disrupting each other’s way of life. 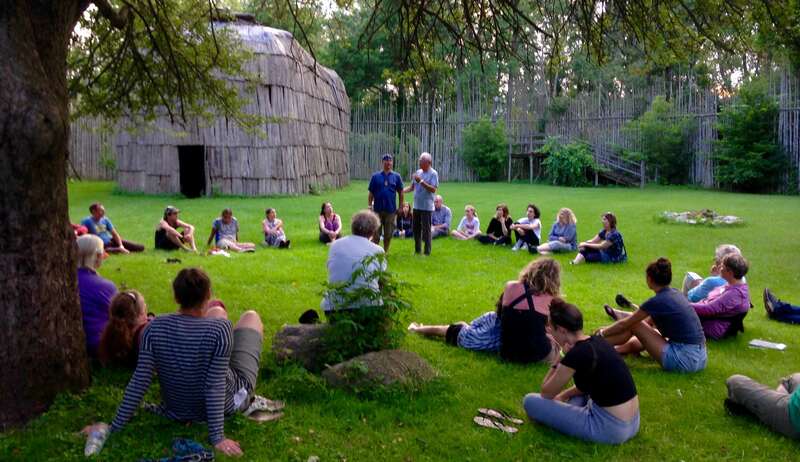 Educational events, traditional teachings, interactive dancing, storytelling, and sharing circles will all be included as we camp along the river each night to rest. 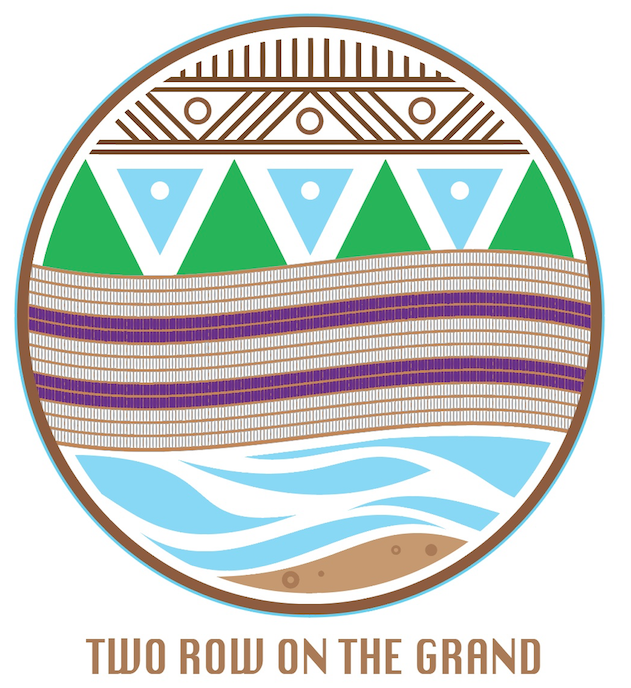 The “Two Row on the Grand” canoe paddle is a symbolic renewal of the Two Row Wampum – the original peace treaty between native and settler communities. We envision an annual canoe trip where participants, native and non-native, build mutual respect and understanding of individual values and culture through friendship and summer fun. Ideally, this experience would result in long-lasting friendships, an increased understanding of each other and our cultures, and through friendship, peace. Participants will be able to partake in educational events given by knowledgeable persons each day: treaties, cultural teachings, dance/social demonstrations, storytelling, environmental concerns, and sharing circles. We have approval from all municipalities along the Grand River to stop in each community and host cultural events open to local community members. Through this experience participants can build long-lasting friendships with those in surrounding communities. At the end of the canoe trip we will host a culminating event that will commemorate the polishing of the chain of friendship between Canadians and Six Nations community members. We’re a grassroots group of local canoe enthusiasts who want to spread awareness of the Two Row Wampum in a positive way. By carrying the idea of the Two Row Wampum down the Grand River we can re-polish the chain of friendship with our neighbours and each other while having summer fun. The group was created as a direct result of the success of the Two Row Wampum Renewal Campaign in 2013. Details of this successful initiative can be found at http://honorthetworow.org/epic-canoe-trip. Four Canadian and Haudenosaunee members of this journey agreed that a similar initiative would be of benefit to Haudenosaunee and non-indigenous community members along the Grand River corridor. This experience was transformational for us and we wanted to create an opportunity for more of our neighbours to participate in this journey of healing. In sharing circles as the trip was coming to a close, we found that it had such an impact on people’s lives that we felt it important to offer the experience on an annual basis. Originally signed in 1615 by the Mohawks and the Dutch, the Two Row Wampum Treaty states that both nations will travel down the river of life in peace together— the Dutch in their ships and the Mohawks in their canoes. Further, each would have their own laws, values, and cultures, and would not try to ‘‘steer each other’s boat’’… tell each other how to live. The Two Row Wampum is the basis for all the treaties that followed. It was one of the wampum belts involved in the Treaty of Niagara in 1764, which confirmed the Royal Proclamation of 1763. These agreements underpin the Canadian Constitution. 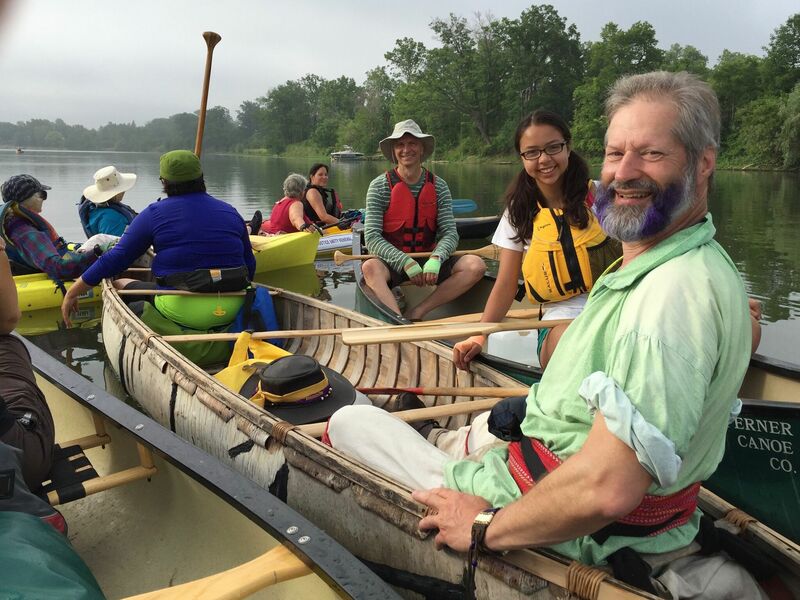 The 2019 Two Row on the Grand canoe paddle is a nine day canoe trip down the Grand River from Cambridge to Lake Erie that will promote healthy relationships, friendships, and respect between cultures, allowing natives and non-natives a chance to grow in understanding based on trust and respect. If you are planning to camp the night before the first day’s paddle and take part in the weather-dependent dawn paddle on Lake Erie on August 2nd, your trip will touch on eleven days. In registering, all participants agree to the guidelines below and agree to follow them during our time together. Failure to comply will result in your leaving the paddle at your own expense. The cost of participation is $60 per day per participant ($45 for children, $30 for volunteers) covering food, camping, and logistical support. However, nobody will be turned away due to lack of funds. We also need support on tasks like setting up for events, camping and meal sites, making food, security, conducting outreach to local communities and much more. If you’d like to assist with those tasks (or to spend some time paddling and some time assisting onshore), please let us know when you register! Great opportunity for volunteer hours for high schoolers! I’m getting into shape, what pace and distance should I target? Be able to leisurely paddle 5-6 hours at a time. How far is a day's paddle? We will paddle between 13-24 km (8-15 miles) each day; camping along the route.The itinerary is established and available above. Any changes will appear on our Facebook group page. What is your Facebook group page? Do we HAVE to paddle in a certain formation? We’ll depart and arrive in formation whenever possible. If the journey gets messy? That’s fine too. We’re supposed to be bonding after all! Do I need to bring my camping gear in my canoe with me? No, ground crew transports everyone’s gear. Bring only what is recommended on the water (a gear list will be sent to you upon your application’s approval) so we take up as little space as possible. Should I bring refillable water bottles, plates, cutlery and to reduce waste? Absolutely! We will provide potable water for refilling your bottles and dish washing facilities for your plates and cutlery. In 2018, we have a Two Row mess kit for the first 100 registrants as part of your package. What happens in the evenings? Educational and traditional events, usually after paddling and before meals. The gatherings will feature traditional sharing and environmental talks by Haudenosaunee leaders and our allies. These events are listed on our Facebook Event Page as confirmed. Will we be meeting the public when we stop? May we invite people to come? You may invite people to come to our events. However, we are limiting our overnight campsites to paddlers and ground crew for safety measures. What do we do if there is severe weather? Most paddlers will be prepared to paddle even if the weather is unpleasant. It can be invigorating! We will evaluate each situation and if there is imminent danger we will lead you to shelter. Thunder is sufficient warning to leave the water.